The sixth stage of the 2019 Dakar Rally saw competitors go from the overnight bivouac of Camana, to San Juan de Marcona. 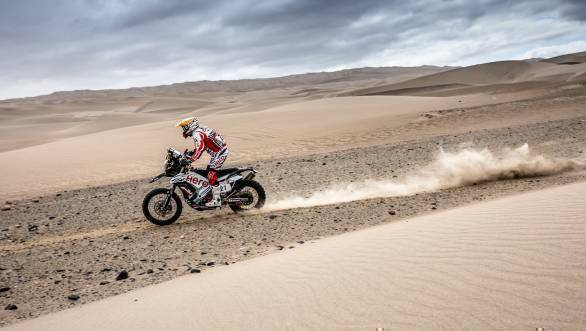 It was a tricky stage, with three quarters of the stretch made of the sandy terrain. 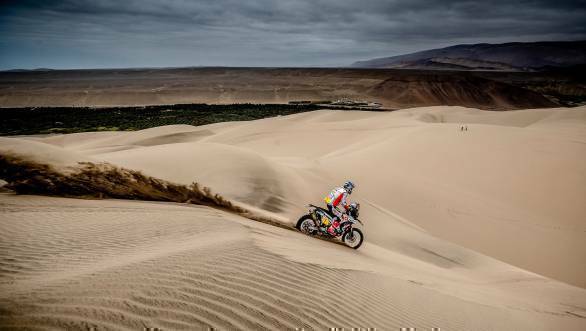 There were also four dune sectors, that were apparently designed to make the challenge tougher, and cause a shuffle in the leaderboard of the 2019 Dakar. The challenges continued for the Hero MotoSports Team Rally outfit, who were determined to put behind them the events of Stage 5. Now, with only two bikes still in the rally, the team proceeded with caution. Oriol Mena, who has stunned so far in his second ever Dakar Rally, was recovering from his Stage 5 crash. The Spanish rider was determined to make it to the finish line safely, and rode carefully to ensure that would happen. However, unfortunately for Mena, he ran out of fuel close to the finish line. In the true spirit of sportsmanship, Mena's team-mate Joaquim Rodrigues stopped and dismantled his motorcycle to get fuel out and give it to Mena. This meant that Mena was able to finish the stage ranked 20th overall. Meanwhile, JRod lost time putting his bike back together, and eventually was able to ride to the finish line, crossing it 30th according to the official standings on the Dakar website. It was a shame, because JRod started the day well, and seemed like he could make it to a top 10 finish in the standings. The results of the stage mean that Oriol Mena is currently ranked 13th overall, while JRod is ranked 25th overall after six stages. Speaking of Stage 6, Mena said, "My aim was to regain my confidence after the tough last stage we had. I am happy with the way I rode today - it was nice and smooth. But towards the end of the stage, I ran out of the fuel and had to stop. My teammate Joaquim helped me out with the refuelling and we made it across the finish line. So one more day gone and one day less to go." JRod, who lost time helping his team-mate said, "I had a good feeling today with the bike and got into a good rhythm. The stage was fast with lot of sand and was quite dangerous. Towards the end of the stage I stopped for some time to help Mena with the refuelling. Lost some time there but it's ok and I am happy to make it to finish line today. "